Photography aside, I also like revisiting amazing places. I don’t know why someone would ever pass up the opportunity to visit places like Uluru, the Great Barrier Reef or Sydney Harbor, even if they had been there before. Here is my schedule of where I’ll be on what days. If you are in Australia and will be in any of the cities as I’ll be passing through, let me know. Maybe we can meet up. During December I’ll be doing several Google+ Hangouts with people from the various states I’ll be visiting as well sharing tons of photos via Instagram, Facebook and Pinterest. I am also going to be an CorOZpondent (get it?) for Australia Tourism. You will be able to see my updates on the various social media outlets for Tourism Australia. I noticed you aren’t visiting Tasmania? I am originally from Tasmania and I can tell you it is an absolutely beautiful state and really worth a look. What an awesome opportunity to go to Australia for a 3 week adventure. Even though this isn’t your first time, I’m sure you will still come back with some beautiful photographs. Nice plan and I like how you chose a not so standard route. Grampians is must, try climbing or absailing mount Arapiles. Just out of curiosity, where do you get your map photos? Do you make them yourself, they’re nice, simple and easy on the eye. I could use those in office presentations. What a great trip! Still on our bucket list…hopefully we will be visiting there soon! Great time of year to get down under. Not a small distance you’re covering either! Are you hitting up anything you missed from the 08 trip? There are bits of Queensland and South Australia that I haven’t been to before. Sounds like an awesome trip Gary! Did you design the map/infographic? Love that and would love to create something like that for my travels. No. That came from the G Adventure’s website. Wooow, really big trip :) Hope You will see everything you planned to :) Good luck ! Hi Gary, we enjoy following your travels online and would love to say g’day when you’re in Melbourne. Please let us know where you are doing a meet & greet with your fellow travel lovers, as it would be great to meet you. Cheers. Pete & Alli, I’ll be in Melbourne after Christmas for several days. I have enough people interested that I will probably host a meet up in Melbourne. Details to come. You’re going to all my favourite places! 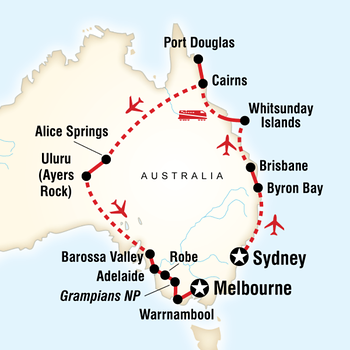 Whitsundays, Uluru, Melbourne. Did you visit Coober Pedy before? It’s… strange. I went as a teenager and wasn’t too keen on it but now I want to revisit it. I’m gonna be in Melbourne all through December, so I’d love to pop into the city if you’re doing a meet up. I’m in Brisbane. Looks like you don’t have much time here though! If you need anything let me know. That’s a cool trip! We are in Brisbane so maybe u’ll find some time to meet us. It’ll be great! Enjoy Australia :) Juli + Sam.